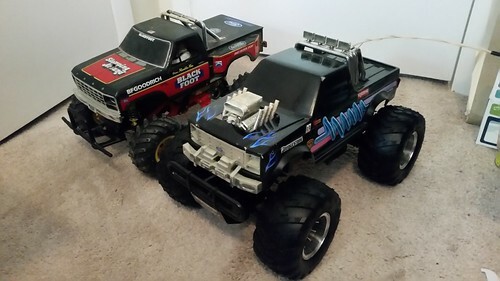 Having been through all the early Tamiya monster trucks, I decided to get into some Kyosho monsters. These were well known back in the day, but unlike there Tamiya counterparts, have faded into obscurity. 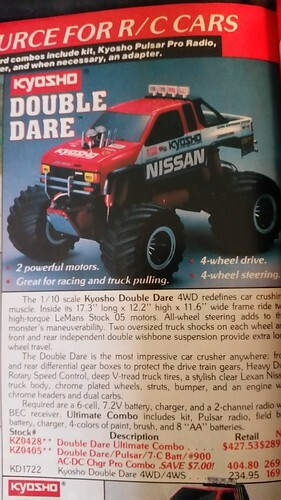 All the early Kyosho trucks, Big Brute, Hi-Rider Vette, Double Dare, USA-1 and Big Boss are all based around the same design (the USA-1 perhaps being the most unique). Swap bodies, tires, wheels and shocks around and the three 2wd monsters are essentially the same truck. I acquired a couple of Big Bosses for reasonable money so I decided to show what goes into these trucks. They are far different from the nice high end Kyosho vehicles and in many cases leave a lot to be desired. That said, they aren't totally bad and certainly better than trucks like the Royal Crusher or Big Grizzly. Here's one of the Big Bosses before tear-down. As you can see, its bigger than its main competitor, the Blackfoot. While the 'Foot has its share of faults, its the better truck in my opinion. Curiously, I've seen pictures of the Big Boss with a different paint scheme, simply called "the Boss". The Big Boss variant also had a full size truck modeled after it. Here's how the rear gearbox (and front bulkhead, essentially like an empty gearbox itself) plugs into the chassis. Supposedly, this can be a weak spot that can lead to a cracked chassis. I've not yet experienced this. Remember this picture next time you hear complaints about the original Blackfoot's axle system. The Blackfoot at least used metal...the Kyosho, not so much. That's a 100% plastic outdrive riding on a bronze bushing (the earlier trucks used plastic bushings). I can only imagine the bushing sawing away at that outdrive. Bearings are a must. Next to it is a 100% plastic halfshaft. Hey, at least the Falcon had metal crosspins. Speaking of the Falcon, the stub axle end is a metal/plastic combo similar to the Tamiya buggy. 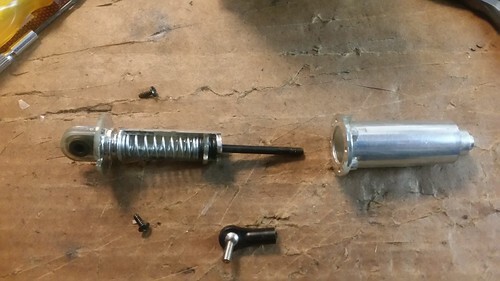 The axle has been known to strip and slip in the plastic drivecup. 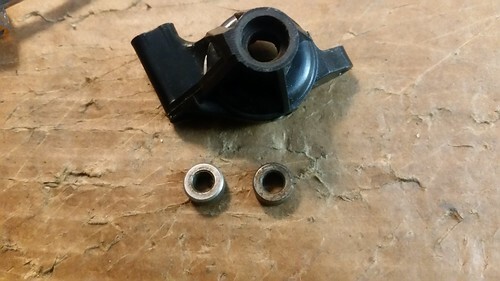 Most of the truck may have been conceived as a truck as Kyosho claimed but they raided the Pegasus buggy parts bin for this important part of the driveline. More to follow. 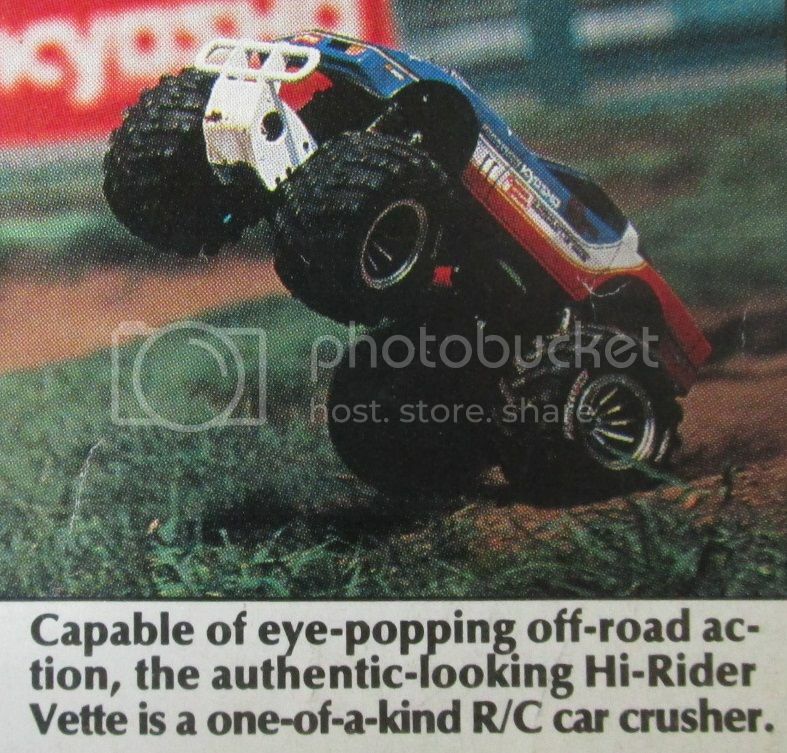 I loved the Kyosho monster trucks back in the day but they were more expensive than Tamiyas. I liked Tamiya vehicles better, though. Anyway, I happen to LOVE that Big Boss you have there!! Lovely monster!! About your comments, yes, the empty front gearbox is there because of the Double Dare. 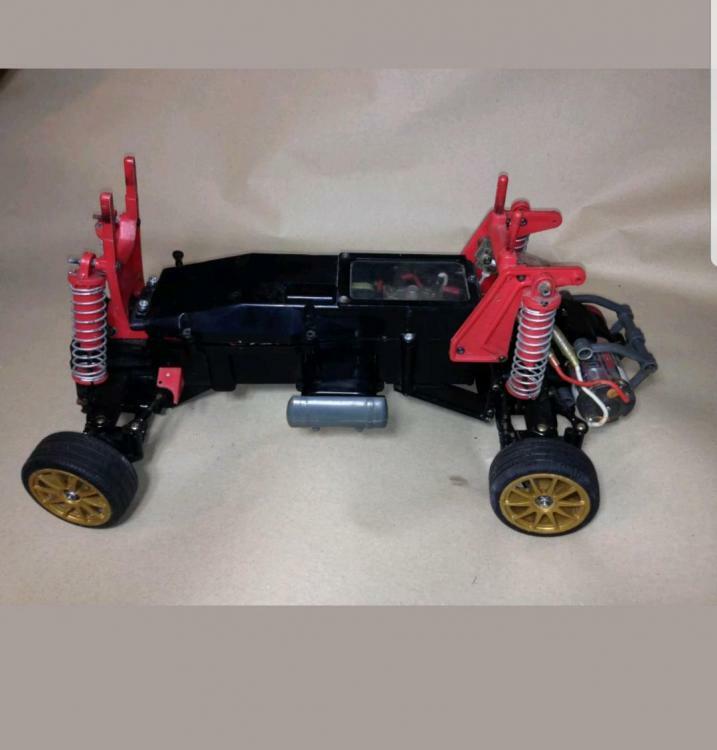 As you said Kyosho used that same chassis in all of the car crushers they did back in the 80's. So you see their 2wders had to go with that empty gearbox in front, Brute, Riders, and of course the Big Boss. Also, don't diss the plastic drives as those outlasted the blackfoot's all the way! Plastic is not really a bad thing if the design is correct. I have plastic dogbones made by CRP as upgrade in my own Blackfoot. Oh, and the Boss is something I have seen somewhere too. I think it was some odd release for a diff market. Here's some pics from a catalog I have. I think you'll like them. 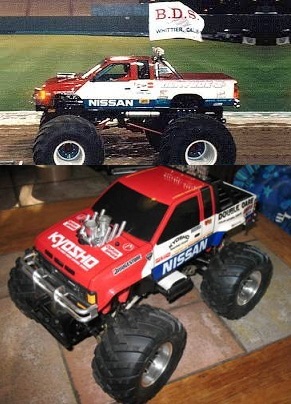 Kyosho should bring these trucks back. They would sell alot of them. I should add a disclaimer to this series of post. While it may seem like I'm being hard on these trucks, I do like them. Next to Tamiya, they were the next best. I'm just pointing out the pitfalls and issues to those looking to get into them. When I was young, magazines like RC Car Action glossed over these issues, happily blowing sunshine everywhere. Also, don't diss the plastic drives as those outlasted the blackfoot's all the way! Plastic is not really a bad thing if the design is correct. I have plastic dogbones made by CRP as upgrade in my own Blackfoot. This is a fair and true statement. Of the three axle components, the plastic halfshaft actually gave the least amount of issues. My USA-1's are twisted from the previous owner doing copious amounts of wheelies, but they never broke and still work fine. Those CRP halfshafts were a nice upgrade for those not wanting (or affording) to go the full Thorp route with their Blackfoots. Here's the gearset. Kyosho supplied a brass pinion which beats the cheese aluminum pinions Tamiya normally supplies (Lunchie, Blackfoot and the like, being an exception). The next gear appears to be nylon but the counter and diff gears are just normal, un-reinforced plastic. 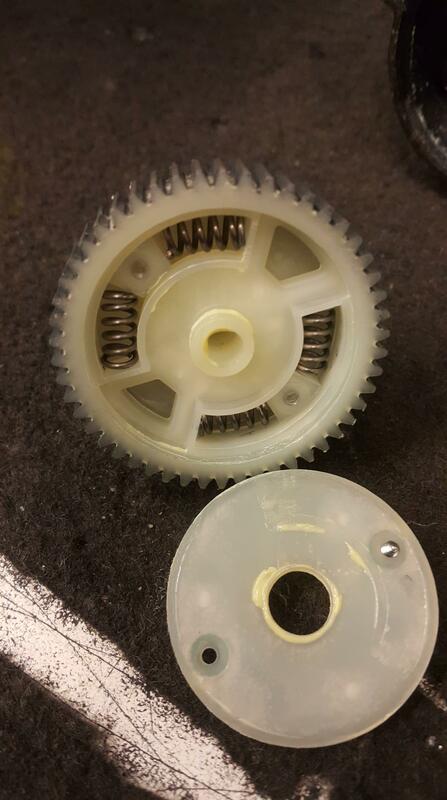 I haven't had issues with the diff gears (even with the molded-in axles for the spider gears) but the counter gear is another story (not that its the gear's fault in this case as we'll see...). This is the shaft the counter gear rides on. While well supported on one end, the end pictured is (as you can see from the angle the shaft lazily sits in its gearbox bore) very shallow and very sloppy. This slop allows the counter gear to move about, accelerating wear. 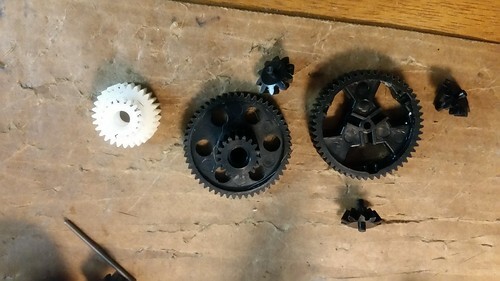 So far, of the gearboxes I've had apart, this gear seems to the most worn in my experience. The previous owner of this Big Boss must have had issues (the bore is quite sloppy as you can see) and broke down and installed Hobbico's Max Trax steel gearset with spool. I'll be installing stock gears back in the gearbox as I plan on fixing the cause rather than the symptom (and I want diff action). Here's a knuckle with its steel bushings. 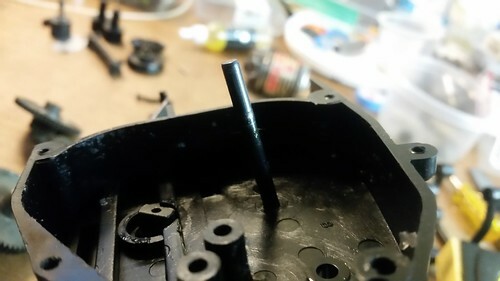 Kyosho upgaded the bushing material in the USA-1 and Big Boss. Earlier trucks used plastic. Oddly, they used actual steel and not the usual bronze on the outer bushings. I'm not sure if the effects of steel on steel are good or not but this truck will get bearings anyway. The knuckle is a supposed weak spot on these trucks although I've been lucky so far. I know early Double Dare knuckle breakage was such an issue, Kyosho reformulated the plastic in newer versions to fix the problem. Surprisingly, its one of the few things RCCA actually was transparent about. Last bit of dissection pics before repair and reassembly. Its hard to see but the webbing on one front bumper mount is starting to crack. The bumper is pretty rigid and screws solidly to the front bulkhead. All the impact force transfers right to it not unlike the Tamiya King Cab. Something to watch out for when buying a used truck. 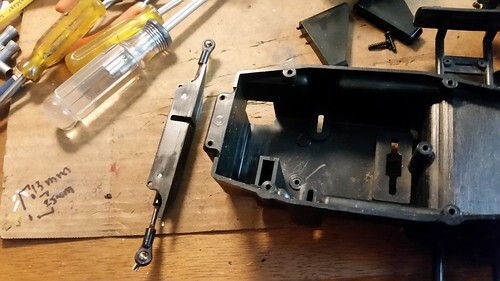 Kyosho monsters rely on a huge sliding plastic bar that the servo moves back and forth through a hole in the front of the chassis tub. Reportedly, its pretty sloppy, but gets the job done. 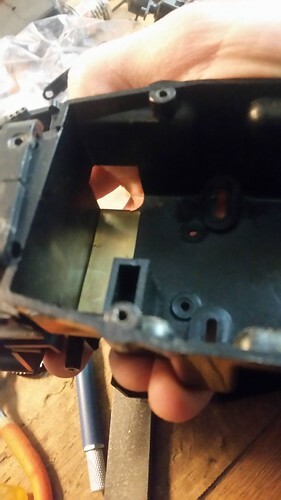 Its a loose fit so it doesn't seem to jam like a Boomerang's can, but it still saws away at the bottom of the chassis where it rides. I'm going to attempt a non-invasive fix. The suspension uses brass balls captured in the suspension arm ends. There's a bit of wear on this one, making the whole front end kind of sloppy. Its not far off from the wear issues that plagued the original Hot Shot. Not pictured are the inner pivot pins. The pins themselves are massive. Mine were rusty, but cleaned right up. Thanks for posting, interesting to see the ins and outs of the truck. I find some of the design decisions interesting, in some ways it's inferior to some of the stuff Nikko and Radio Shack sold as range toppers to compete with entry level hobby grade. Not trying to bash Kyhoso at all, Just impressed by how good some of the high end Nikko stuff really was, metal diff gears, cups and dog bones etc. I've even found some with 2 part spur gears with damping springs inside! I'm sure just the bearings will make a big difference but I'll be reading intently to see what other mods or fixes you work out to improve/strengthen it. Always liked the Vette. Surely the lunchbox would have been nearly half that price back then? Surely the lunchbox would have been nearly half that price back then? The Vette was $119 in the old Tower ad @mongoose1983 graciously posted. The Lunch Box, from memory, ran a low of $85 early on, with prices steadily rising the about $95. Blackfoots ran roughly $99 and Monster Beetles around $130 for comparisons. Here's a couple of repairs while I wait for bearings to arrive. 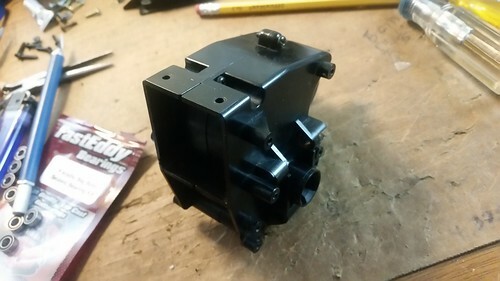 I could have approached the sloppy bore for the counter gear shaft a couple ways, but on these old, unrereleased models, I prefer the least invasive way possible. The tiny curl of metal seen in the bore is some shim stock fashioned to shape. 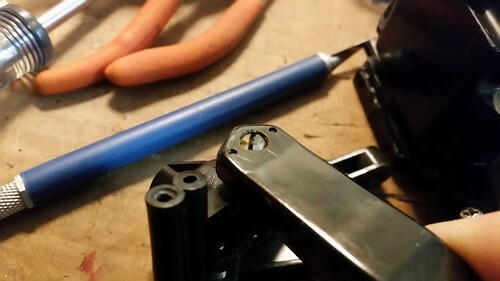 Once the shaft is inserted, the shim takes takes up the extra clearance. Its fairly thin (like .0012, in this case) because putting explosive pressure on old ABS is not the best of ideas. A snug fit, but not press fit. Shim stock to the rescue again, brass in this case. This brass provides a nice smooth sliding surface for steering's sliding bar. The ABS chassis gets scored up with use so the brass protects this area of the chassis while taking up a little of the excessive clearance. Its not shimmed tight, but its an improvement. The system as a whole will never be great without a total redesign which I'm not willing to do as I like to keep this old stuff mostly stock. For a big ol' fun monster truck like the Boss, the system is serviceable. I might have to try and fit some hex wheels on there for now and find a body shell to fit. Yep, that's a Big Brute alright. I've been looking around for some more common 2.2 hex wheels + tires that evoke the originals. So far I'm thinking HPI Wheelie King Mud Thrashers. They're kinda in between Big Brute and Big Boss height-wise. The originals I have are too nice to run. 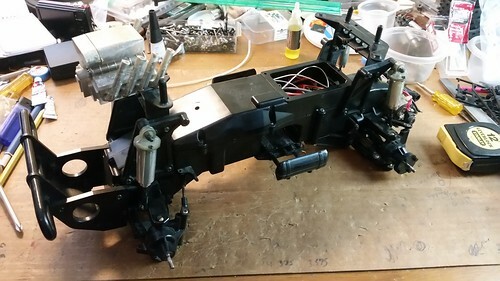 Really enjoying this look into a period Kyosho monster truck. Makes the clod seem quite revolutionary considering they were around at the same time. I really want a double dare, it looks like a King Cab that spent too much time at the gym. Back in the late 80's I used to think Tamiya went for scale looks while Kyosho aimed at performance with a vague bit of resemblance. 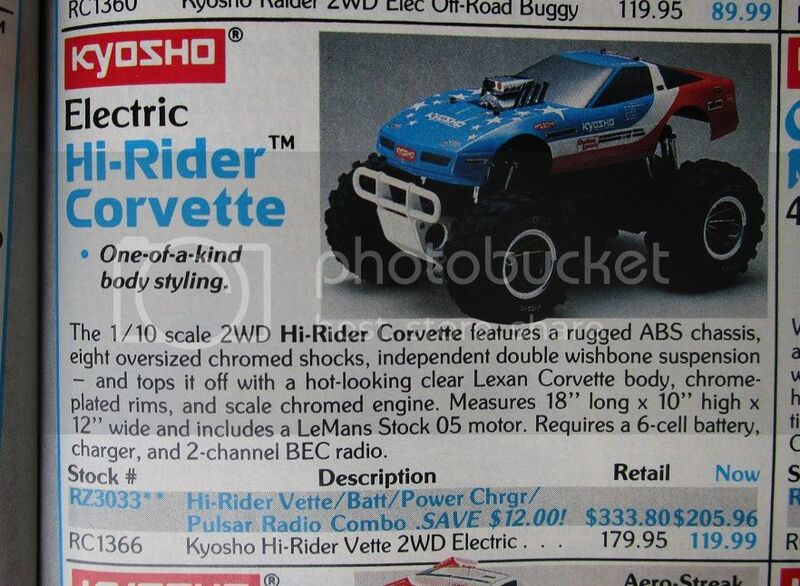 It's funny... when I was shopping for my first RC car, I really wanted a Kyosho Pegasus, but the local hobby shop guy talked me out of it, calling it "junk out of the box." His main reasons were the plastic living-hinge suspension arms and the plastic dogbones and outdrives. I took his advice and bought a Grasshopper, but I always had a soft spot for the Pegasus (and even more so, the Icarus). Fast forward 30 years, and I have restored and sold on a Pegasus, an Icarus, a Cox Ultrastock, and I have a nice Cox Bandido on my shelf as part of my permanent collection. Out of those four, plus two parts cars, how many had issues with the dogbones, outdrives, or suspension arms? I can see that. In a buggy application, those parts work just fine. In the trucks, I have a set of dogbones that are actually twisted. They still work though, which is more than can be said for those suffering from ORV hex drives slipping (though I've yet to personally experience that myself). I just really wish Kyosho ran bearings on the outdrives. Even if it works, the thought of two sacrificial materials riding on each other makes me cringe. Personal hangup on my part. .
Really enjoying this look into a period Kyosho monster truck. I'm glad to hear it. I was debating on wrapping this thread up. I thought the Kyosho monsters might be a little too obscure at this point except for monster truck diehards like @mongoose1983 and me. Thanks! No way. Really enjoying this. These were the unobtainable icons of childhood. I saved for *years* to get my first RC (ended up being a kyosho optima mid). Please do continue to share. I love seeing these trucks and I also get to learn from your repair and restoration techniques. Exact same story for me!! For two years I saved and sold things to finally get a Tamiya when I was 15 years old. I chose the Midnight Pumpkin over the Blackfoot, even though it was a lil bit more costly. And I remember dreaming one night of coming through the Hobby store doors carrying the huge Clod Buster box all new and with a smile on my face, haha. I don't think I was happy of waking up to find out it was just a dream! Noooo I've been admiring these things from a distance for the past few years and then a dirt cheap fixer upper appears on ebay days after I see your post. It has to be fate! I liked that color in the Car Action review, maybe even more than the boxart yellow. That whole review has that zany '80's/metal feel thanks to author Chris Chianelli (RIP) of course Lola the Queen of Rock and Rolla and here "two" junkyard dogs. The Blackfoot review also has some interesting shots with a pair of very "80's" women . 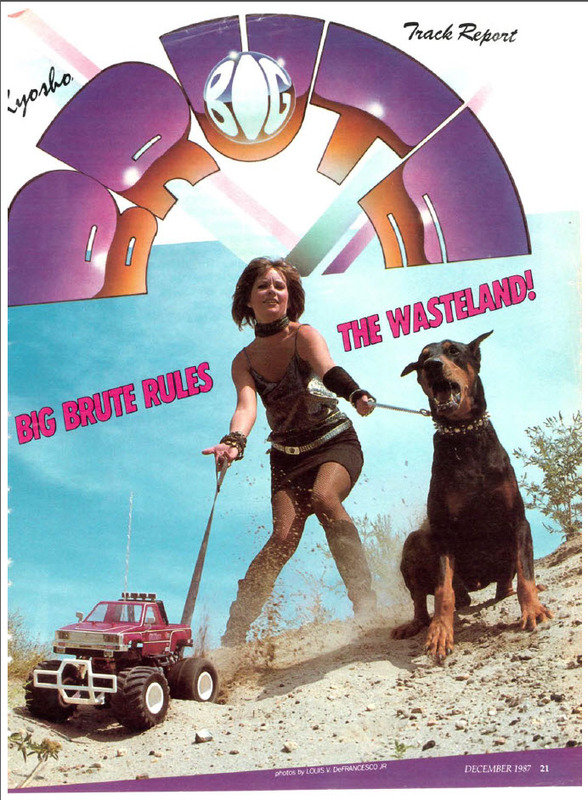 Back in the day the the Big Brute review with that "wasteland" concept and of course the girl's hair reminded me of the Cherry 2000 movie with Melanie Griffith. Oh I sure remember that one! Think have it somewhere. Talking about colors, I have seen Big Brutes in dark red and they look fantastic with that color, too. Yay! My bearings arrived. 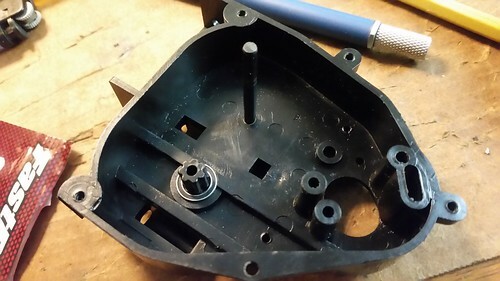 I feel much better seeing that plastic outdrive properly supported by a bearing. Also visible is the counter gear shaft, straight, and firmly seated in its bore. Together at last. Not the most interesting of shots, but it took awhile to get here. The first problem I hit was needing the center shaft the diff gear rides on between the two outdrives. The previous Max Trax steel gears used a different proprietary shaft. Being anxious to get the ball rolling, I headed down to the local hardware store to get some steel rod to fashion a shaft. Being in the US meant the closest I could find diameter-wise was 1/8" standard or .125". I needed roughly .119" to fit the gear center hole. So, after some time with the rod chucked in a drill and a piece of emery cloth, I had the desired diameter. I put mostly new OEM gears I had in stock in the gearbox. I was binding pretty badly initially with a pronounce tight spot in the rotation. 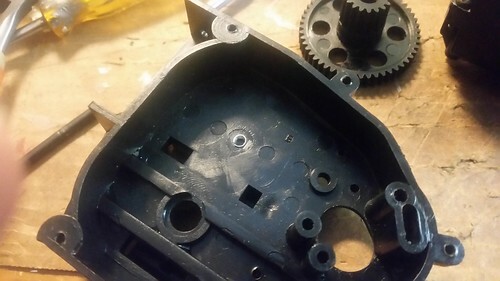 Close examination of the gears revealed mold flashing on the end of the counter gear teeth. 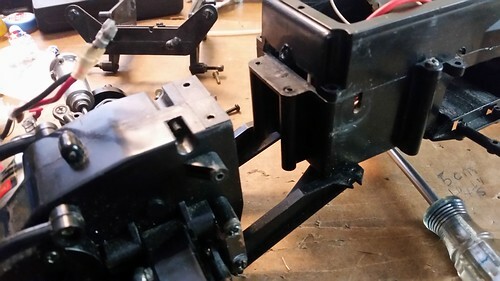 With memories of the original RC10 gearbox in my mind, I carefully filed the flashing away. Now all is well. It certainly doesn't fall together with the relative smoothness of a Clod Buster or Lunch Box gearbox. On the other hand (despite the earlier mention of it), the gearbox didn't require near the amount of work the old 6-gear RC10s did. Oddly enough, thinking about Chris Chianelli (the author of the RCCA review above) I re-watched the "RC Car Companion" video which is available the see on youtube. Chris (with his famous rock 'n roll hair) is shown suggesting to run-in gears with toothpaste, as a lapping compound, for a smoother gearbox. He's even holding a Big Brute bevel gear in the scene. I should have whipped out my tube of Colgate I suppose. A word on shocks and tires. Here's the parts that make up a Big Boss shock. From what I can gather, all the Car Crushers essentially use the same friction type shocks but vary in springs, numbers and finish. The Big Brute used its own unique shock towers. The shock bodies also used external springs. Research in the various reviews, videos and literature lead me to believe the Brute's springs were too soft. This problem was made even worse in the Nitro Brute. The Hi-Rider Vette used new shock towers that allowed for dual shocks to be mounted at each wheel. The shock bodies were chromed and now fitted with stiffer internal coil springs (like the Boss's) to alleviate the bottoming out problem. BTW, the second set of shocks were dummy shocks with no springs. The Double Dare used the same arrangement as the Vette, albeit molded in red to better match the paint scheme. The Big Boss simply reused the Vette's towers and shocks with the elimination of the dummy shocks. The USA-1 stood as the most unique. 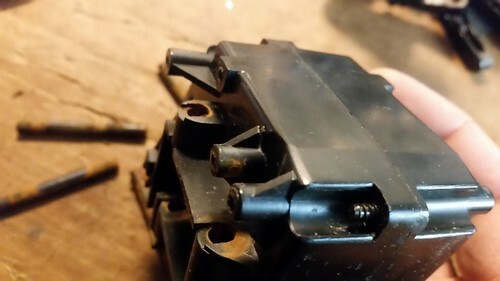 The same shock bodies were used again (molded in black) with the return to external coil springs, 8 in total. The shock towers were upgraded to aluminum. Probably the hardest thing to source on these old Kyosho trucks is tires. They were quite soft originally and many have succumbed to rot. 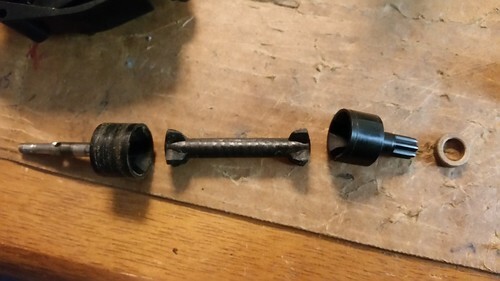 Kyosho mostly used a unique size and multi-piece wheel construction (basically a bead-lock), making modern day replacements tricky without simply retrofitting hex-drive and common 2.2 tires. 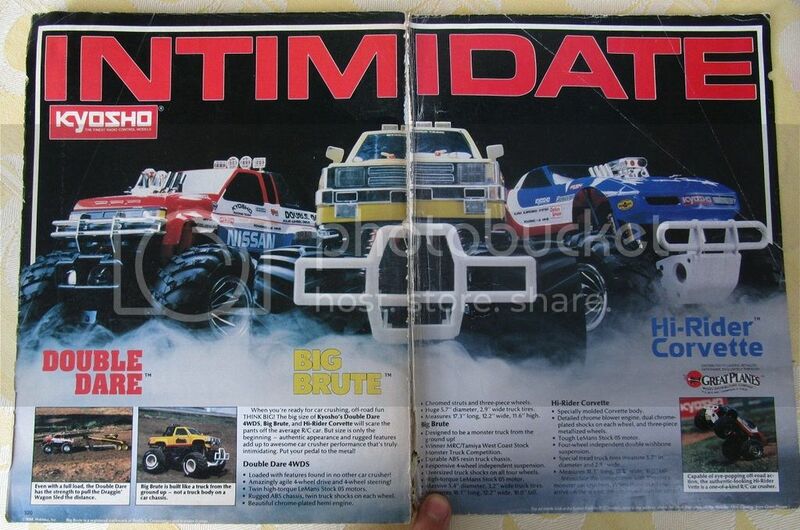 The Big Brute and Nitro Brute used a shorter but wider tire with chevron tread tire. The USA-1 came with tires slightly bigger than Clod Buster tires (although Clod type tires can be used as replacements). The A-1's rubber was supposedly a sought-after tire for Clod racers, being a better compound and lighter as well. The rest of the trucks relied on a taller, but narrower Bridgestone tire mounted on a turbine styled wheel. Interesting, I seen many ad photos like this with the Double Dare running Big Brute tires. In the wild however, all the Double Dare's I've encountered sport the taller Bridgestone tires. Perhaps if Kyosho retained the wider Brute tires, the Double Dare would have been less tipsy.